Nadia Shinkunas, an artist based in Omaha, Nebraska, will be visiting Hastings College on Saturday, February 2, to judge and curate entries in the College’s all-student art exhibition. She will also host a public lecture at 4:00 p.m. on Saturday in the Jackson Dinsdale Art Center (JDAC). There will be time for questions and open discussion during the lecture. The all-student exhibition opens Monday, February 4 in the JDAC’s large gallery. Top prizes will be announced during a reception on Sunday, February 10, that is free and open to the public from 2:00 to 4:00 p.m. in the JDAC. The exhibition will be on display through February 27. Also in February, art students from Kearney High School will take over the JDAC’s secondary gallery. The high school students earned the opportunity to host an exhibition by winning first-place in the 2017 and 2018 Hastings College Mural Day competition. The student’s show opens February 11 and will be on display through February 27. The Kearney art students will also participate in the February 10 reception. Regular JDAC gallery hours during February are Monday through Friday from 9:00 a.m. to 5:00 p.m., plus Wednesday 5:00 to 8:00 p.m., and Saturday’s 10:00 a.m. to 1:00 p.m. Gallery viewing is always free and open to the public during these times. Nadia Shinkunas works with negative space, shadows and details perceived as insignificant. She focuses on how these seemingly minuscule variables like light, shadow or location constantly alter our perceptions without us even noticing. Shinkunas invites viewers to reevaluate their initial perceptions of color, depth and space. She believes that through exercising the mind this way, it allows one to see more of the infinite possibilities in both art and life. After graduating in 2014 from the University of Nebraska–Omaha with a degree in studio art with a concentration on sculpture, Shinkunas launched her own company, Random Arts LLC. 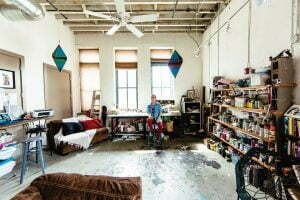 Random Arts has held more than 10 themed group exhibitions in and around Omaha featuring local artists. She’s now focusing on a career as a tattoo artist and plans to continue to learn and grow as an artist, as well as working with other local artists to help the art community thrive.